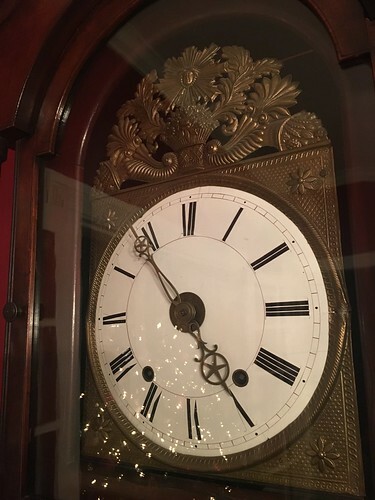 Our lovely antique grandfather clock has been sitting at 4:43 am for over five years! It's crazy to think about it, but if you've seen our clock, either in person or in photos since 2010, it's always read the same time. This means that the clock has actually been at 4:43 ever since we've been writing for this blog! Lulu has never heard this clock's chime, and for Mel, over 1/3 of his life has passed since he last heard the bell ding. 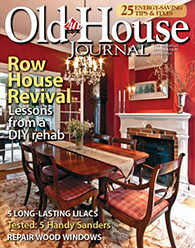 Our dining room was even on the cover of Old House Journal a few years ago, and the clock was sitting at 4:43! But how did we get to this point? 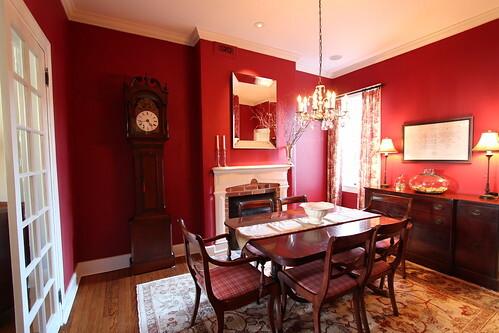 This beauty came into our home after a lengthy search for a clock that would both meet our tastes and tight budget. After years of searching Wendy found this magnificent clock on eBay back in 2005. 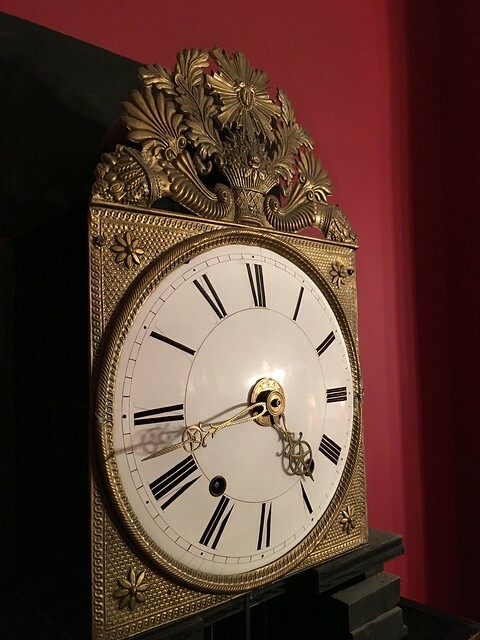 The tall case clock is an American case custom built in the 1840s for a French Morbier "Sun Burst" movement from the 1830s. 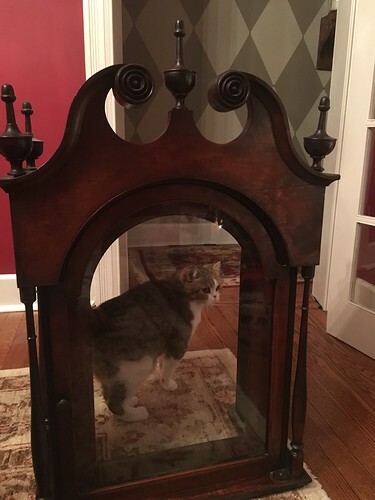 After we won the auction and nervously had it shipped from Colorado, we carefully assembled it in our home to get it up and running in the dining room, where it ran flawlessly for about five years. It's an eight day clock, which means we have to wind it once a week, which is not too bad. For a chime the bell rings the hour count on the hour and a single ding on the half hour. It was fully restored but it has tons of original character while remaining in excellent shape. In short, we absolutely love this clock! Then, in the summer of 2010, Wendy and I were awoken in the wee hours of the morning by by a very large crash at, you guessed it, 4:43 am. We said, "What was that? Is someone breaking in? Did a car hit the house? Did a mirror fall off the wall?" Though we were sleepy and confused, I grabbed my baseball bat and we ventured downstairs to search for the culprit, expecting the worst. Ollie was still alive at the time and was sleeping downstairs, but he'd slept right through the ruckus. We searched all through the house and couldn't figure out where the crash had originated. How could something so loud go unseen? And how did it not wake Ollie up? 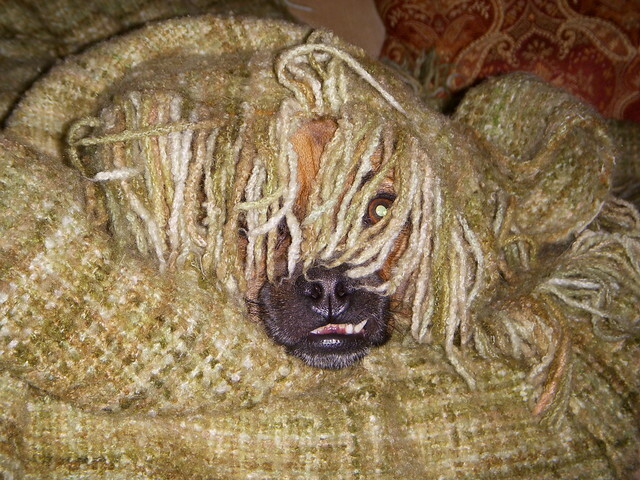 Probably because he spent most nights burrowed like this photo. 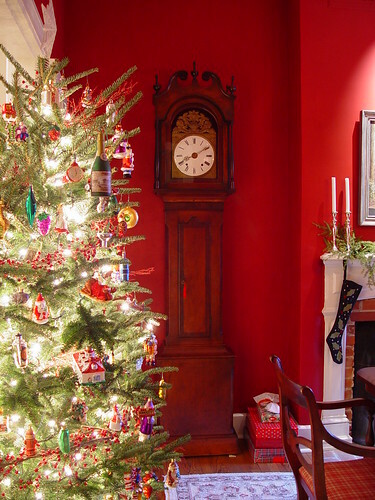 The next day I realized we'd not heard the chimes from our clock that day. Thinking I just needed to wind the clock I started with my weekly routine and immediately noticed there was no resistance from the left weight. 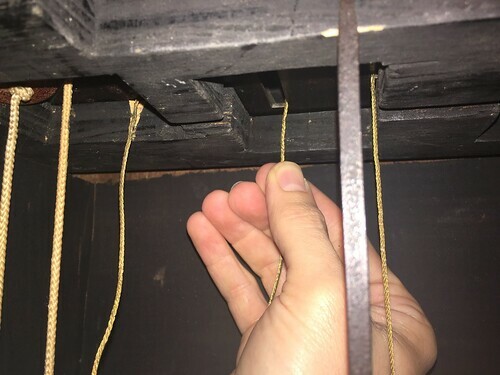 I opened the door and saw a tangle of brass wire where the roughly 10 pound weight normally hangs. It clicked and I immediately knew what had caused the loud calamity we'd heard the night before. 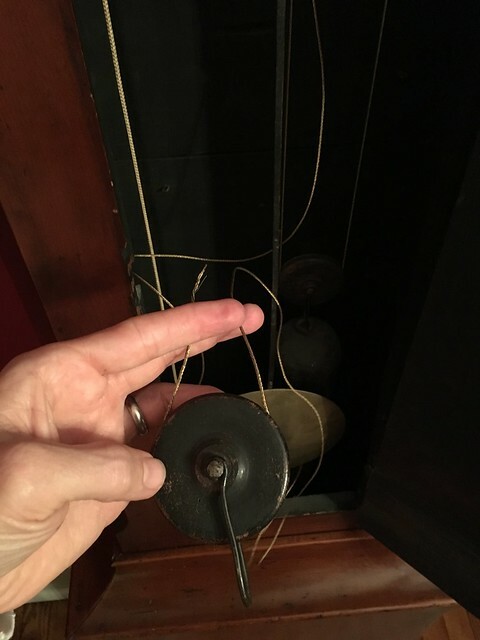 The weight cord had broken and allowed the clocks very heavy weight to smash into the floor below the clock's case. Luckily the clock's case is open in the bottom, so the weight didn't damage the case. It left a small dent in the oak floor but nothing too bad. 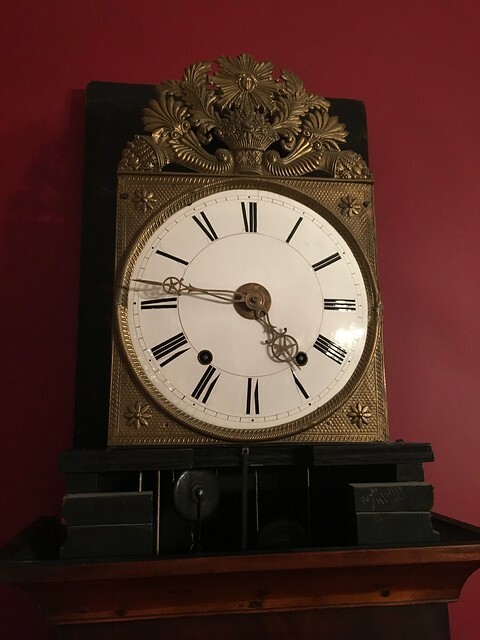 But the problem is, this is an antique clock, and I'm terrified of turning a beautiful and functioning antique clock into a non functioning (but very lovely) decoration in the corner of our room. For years now I've wanted to fix our clock on our own. 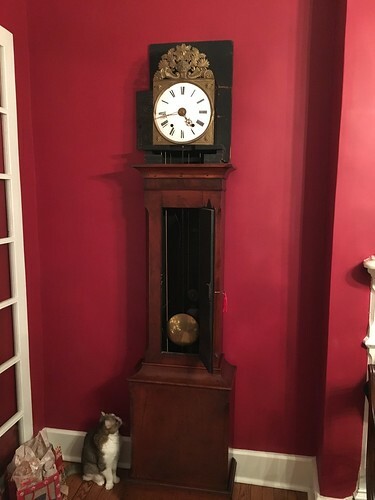 I'm obsessed with antique clocks, especially tall case clocks, and love their general feel. And though I'm mechanically inclined, I'm also completely paranoid because the inner workings of a clock are completely foreign and esoteric in so many ways. 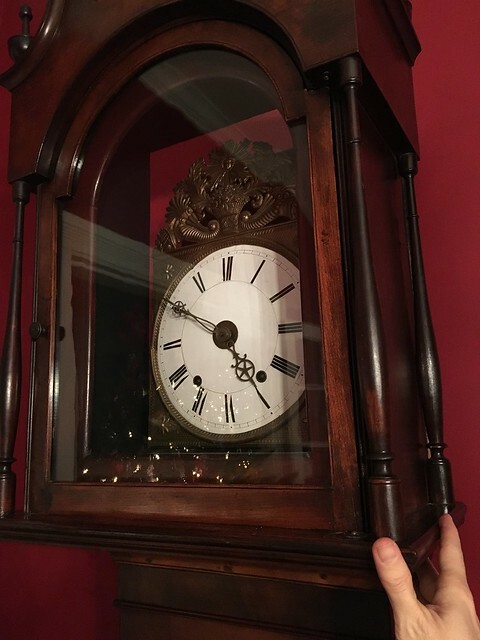 Well, one of our blogging friends, JC (who blogs about the restoration of his 1923 Foursquare), just so happens to be a clock expert. He even has a blog about clocks and clockmaking. 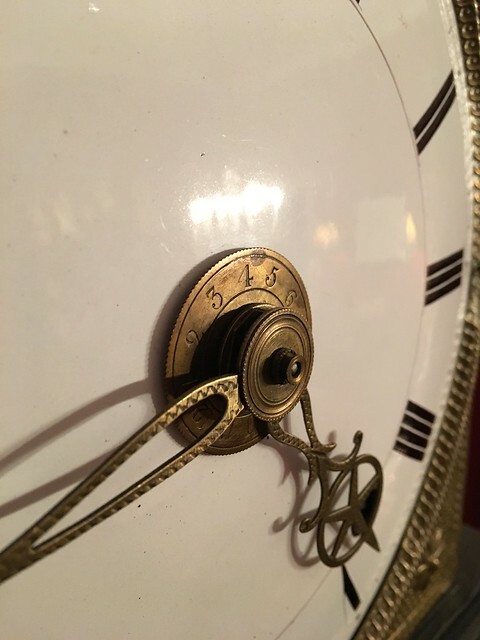 Ever since we started blogging I've been talking to him off and on about fixing this broken clock of ours. And after he recently restored a similar movement, he gave me the encouragement I needed to tackle this repair on my own. Yes, five years of a non functioning clock was enough, it was time we made this antique work again! I started with the simple disassembly of the case. The top of the case slides forward as one piece to reveal the clock's antique movement. Did I mention that I had a feline helper working on this project with me? 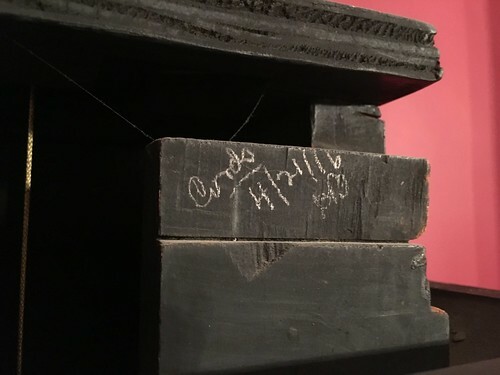 Once the hood was off I noticed a mark in pencil that indicated when the cords were last replaced. The date, 4/21/16, as in, 1916. How very cool? The Morbier movements were made to be hung on a ledge as a wall clock without a case, weights and pendulum hanging free. This is why the whole movement is very self contained once the hood of the case is removed. 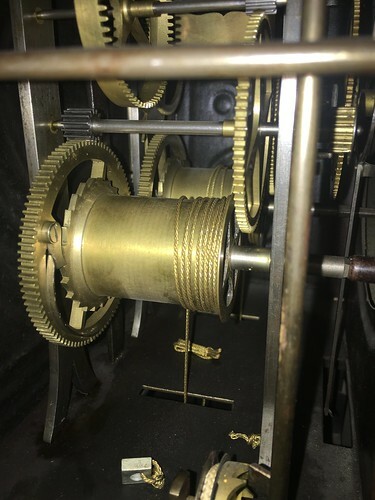 The side of the movement has a little door that opens to reveal the interior. As soon as I opened the door I could see the barrel that had lost its cord. 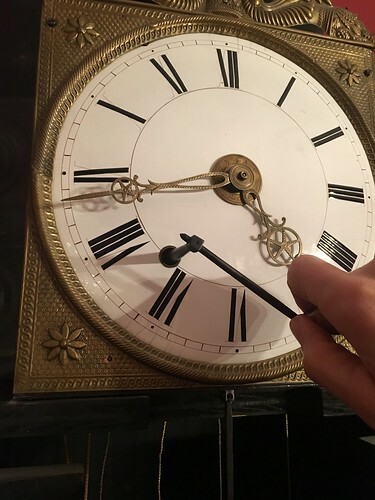 This barrel is supposed to be wrapped with the brass cord (well, actually a cotton cord, but I'll cover that later), supporting the clock's weight that allows it to run. But somehow the cord had detached from the barrel and crashed to the ground. My concern was that this would be a fix that requires a teardown and rebuilt of the movement as I suspected I'd need to remove the barrel to restring the weight cord. However, much to my delight, as I turned the barrel by hand I could see the hole that the weight cord is supposed to thread through. In just that instant the thing I had to do to fix this clock clicked. Over the five years since it broke, I had looked at reference videos and photos, detailed diagrams, clock repair parts, and repair manuals that were hundreds of years old. I had so completely psyched myself out that my paranoia prevented me from just opening up the clock to see how I could fix it. I grabbed the broken end to the weight cord and looped it around the wooden pulley wheel of the weight. The weight hooks onto this wheel, which makes this whole repair much easier, rather than trying to deal with the weight while trying to attach the cord. Once the weight's pulley was in good shape I threaded the cord up and through the case into the base of the movement. In only a few seconds I had the cord back into the movement. I threaded the cord's end up to the barrel and through the hole I saw in the barrel. I grabbed the end of the cord with a pair of needle nose pliers in order to feed a sufficient amount through that would allow me to make a knot in the cord. The goal here is to make the knot sufficient enough to anchor the cord in the barrel but to lose as little length as possible. After I felt like everything was where it needed to be I applied a little tension to the cord and wound the barrel a few times to get some slack out of the cord. It was such a simple fix to this point but I couldn't help but get all excited. We've wanted to fix this clock so many times since it broke, but fear of breaking it further crippled us. I nervously hung the weight on the pulley's loop hoping it would support it and I'd not done something to royally screw things up. I slowly wound the weight nearly back to the top while shaking my head at the fact it had taken five years of obsessing to fix something that only took a few minutes of real, actual work. 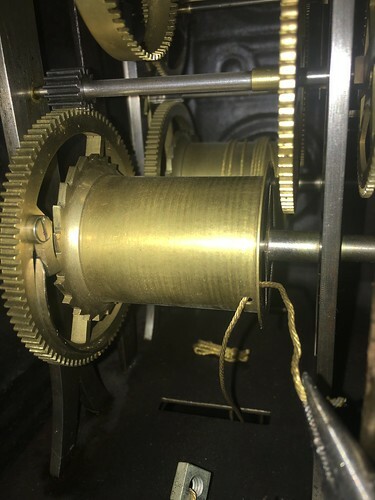 In the photo above you can see a little bit of frayed cord inside the movement to the lower right. That is the little length of broken cord that fell out of the barrel while winding, and the culprit for why the cord gave way over five years ago. Once I had everything wound I hit the moment of truth. I pulled the pendulum to one side and let it go. Tick-tock-tick-tock!!!! A beautiful sound I'd not heard in so long and the clock's hands were no longer at 4:43. 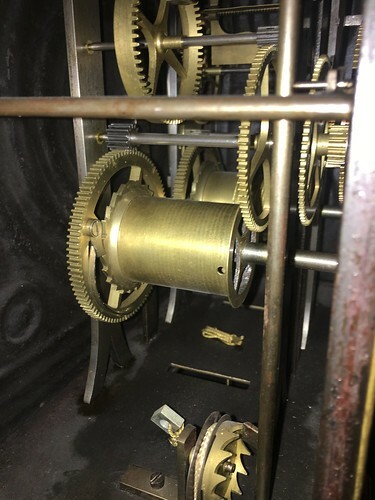 The movement needed to be adjusted and base leveled ever so slightly with a shim of paper to prevent the pendulum neck from rubbing on the case and stopping, but it was all in good shape. Before I completed everything I dusted and cleaned where I could. 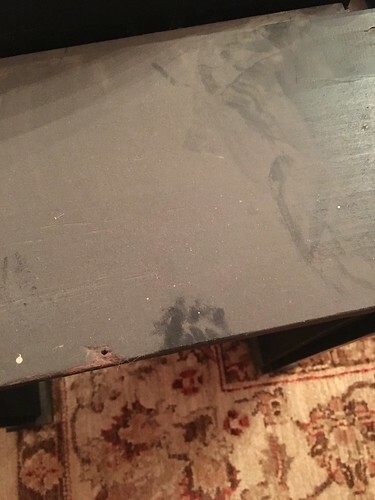 I could clearly see where my helper had attempted to check out what was on the top of the case hood when it was on the ground. I slid the hood of the case back onto the base and triumphantly checked this project off from my mental to do list. I didn't start the clock before I went to bed. Instead I waited until the next morning. Wendy got up bright and early to work out, and while she was out of the house I started the clock and set the right time. She got back from her workout just before 7:30 and that was absolutely perfect timing. The clock chimed the half hour with a single ding and she yelled with glee, "WHHHAAAAATTTTTTT?!?!?!?!" Wendy ran up the stairs and into the bedroom where I was waiting to say, "It's a Christmas miracle!" 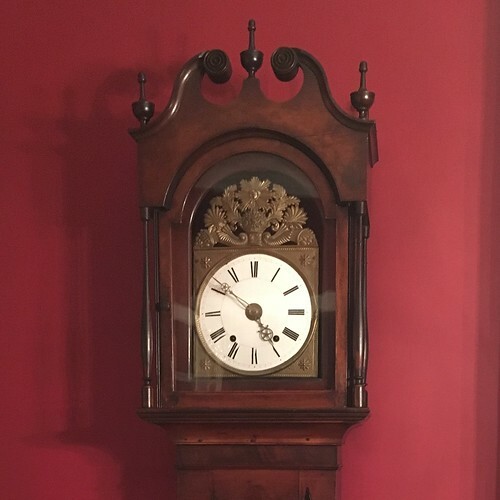 We now once again have a functional grandfather clock that some think sounds a little like a train, but we think sounds quite lovely. The subtle sound of the seconds ticking away, and the periodic loud chimes add such a wonderful melody to our home's interior. I'm so happy to be able to post a video that finally allows you to hear what was only a memory for us for many years. And if you're wondering how Lulu, the dog that barks at door bells on TV even though our house doesn't have a door bell, is reacting to this new introduction. Well, the noise it makes just prior to the chime, along with the chime, apparently sounds a lot like our front door to her. I think she'll need to adjust. As I mentioned earlier, the brass cord we have is not the original or really appropriate weight rope. 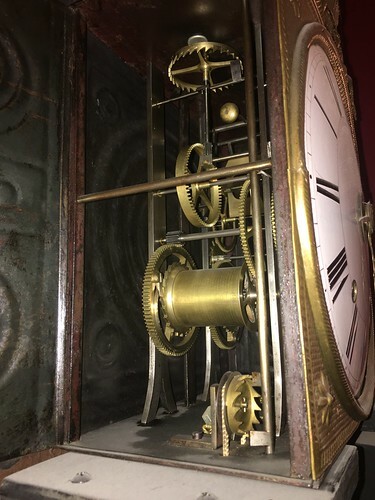 Our friend JC mentioned that this may have been a replacement from a previous clockmaker that works on the clock. Ideally, and originally, this would have had a woven cotton rope. You can see from the barrel that the brass cord doesn't really take up the whole barrel, but the woven cord would. 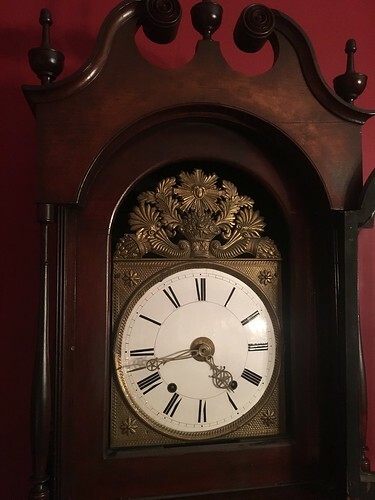 Now that I have more confidence I think I'll order some of the woven cotton rope so I can replace the brass cord and also clean and service the whole clock while I'm at it (since it's been sitting for a while). I'll definitely write more about this adventure when I take it on. Do you have any projects or tasks that you've overhyped in your heart for so long that it's essentially paralyzed you, only to knock it out in very little time when you actually did it? Would love to hear about your similar experiences. Well done, and how nice to hear especially Christmas Eve. Every chime reminds me how much we missed hearing it. Congratulations on getting her running again! We've got a circa 1830 wooden works clock in our living room. It's on the list to get done one of these days (just like everything else in our house...). That sounds pretty awesome! One of these days indeed. I might have to look into a similar class. I need to make a little note. Maybe just when I replace the cords. He definitely does some very nice work! I like how the sound isn't too loud. I'll tell you our crazy clock story sometime. You guys would enjoy and understand our totally insane escapades with it! Lovely! We have a number of old wind-up clocks ... always a challenge! I'm thrilled for you guys! Glad I could help!